The historical King’s College London is in trouble, or at least this is what Sir Robin Murray, FRS and Professor of Psychiatric Research (Mass Redundancies at King’s College London are destroying morale), David Colquhoun, FRS and Professor of Pharmacology (Bad financial management at Kings College London means VC Rick Trainor is firing 120 scientists) and Dorothy Bishop, Professor of Developmental Neuropsychology (No logic in King’s College job cuts) suggest, and they are not alone. he and his senior executive received very strong criticism by most academic staff and their collective representative. Simon Gaskell, Jeremy Kilburn (managers) reacted to waves of evidence-based arguments, written essays and personal representations with silence. Their straw-man in SBCS was making gross misrepresentations (for example telling the students that not a single person would be fired; telling the staff that he had no idea who might be affected, while asking administrators to inform him precisely on the latter question and preparing the new adverts for direct replacements of those being made redundant). Managers who have accepted hundreds of thousands of pounds to perform a restruction cannot utter a single argument in defense of their actions when confronted with anyone who understands what a University is for. This explains why the King’s College lot follow the example of their Queen Mary peers and hide away from the criticisms raised by those who actually have something to do with Higher Education and/or research and teaching. Yet, under the mounting pressure they felt obliged to reply. As no individual is willing to put their name to the restruction, the management group shamelessly use the College’s name to defend what they are doing. 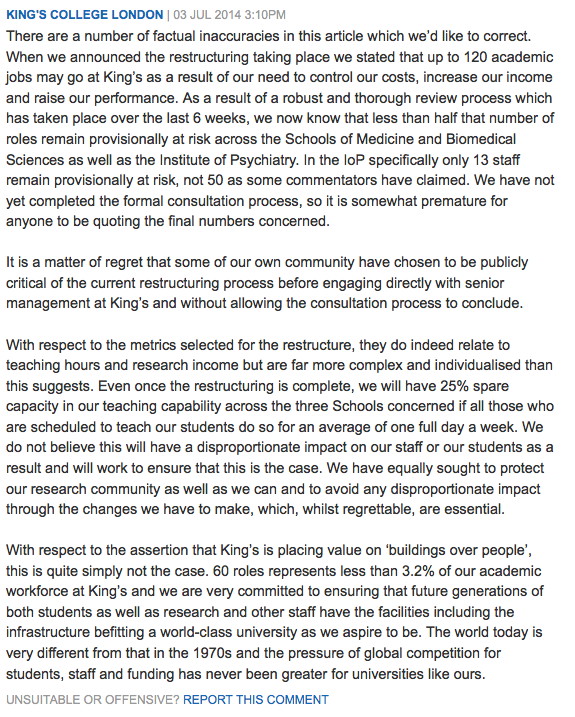 Let us take a carefull look at what they had to say: “When we announced the restructuring taking place we stated that up to 120 academic jobs may go at King’s as a result of our need to control our costs, increase our income and raise our performance.” The managers focus on costs, income and performance. Costs and income relate to finance not to education or research. But what is Performance? “With respect to the metrics selected for the restructure, they do indeed relate to teaching hours and research income”; in other words Performance also is understood as a financial matter by these managers who, having no understanding of Higher Education, ruin it. In doing so they pay a disservice to the whole of the United Kingdom. The UK academy is in very grave decline, and you can be sure that Rosalind Franklin, John Keats, Thomas Hodkin, James Maxwell and so many others would have found themselves on the firing line, as Peter Higgs said. You probably recognise the above-mentioned names. I don’t predict today’s managers will be remembered, except perhaps for one-or-two that will manage to give the system its final blow (…their names and stories will be used as examples for why the word “manager” evolved away from its original meaning). I am coming to an end of this post, but not before I comment on the justification and methods used by King’s College managers as evidenced by their own words: “It is a matter of regret that some of our own community have chosen to be publicly critical of the current restructuring process…” and “The world today is very different from that in the 1970s…” In today’s world, King’s College managers moke and provoke in press the collective representation of academics. This is a time for poetry, royalty, and decision making (boys and girls). Both the UK Parliament and active colleagues in research and teaching should pay more attention: a single warning to the fat cats and their excessive renumeration packages in a letter issued by ministers Vince Cable and David Willetts is obviously not enough to stop the feast. Colleges should not be arenas of class struggle, because science and letters require freedom of expression, resources to test new ideas and concentration to attend to a learning environment rather than to profitable financial transactions. Who can deliver? I post two tweets with links to more news on this story: another Guardian article and a leeked memo published by UCU showing how managers devalue teaching in these exercises and proving that the parallels with the Queen Mary restruction are too many to be explained by chance. The political question is difficult, as on the one hand self-governance of universities is fundamental but rests on the condition that the academic communities are in charge. The current system evolved from this ideal, but now not only are the managers no longer academics; they have turned into enemies of the academic communities and are accountable to no-one, or more precisely, they to themselves and a few peers at university Councils. In general, I would not prefer to see them reporting to any more centralised entity (likely controlled by the same interests that are chewing away academic independence and freedom) but rather that the academic position is redefined with responsibilities of governance (both at the department level and at the university level). However, if it is true that the Universities are accountable to Parliament, then Parliament should be stepping in at this time. There is too much abuse and destortion and great damage. Gaskell, Trainor and their peers should be made accountable as much as Cable, Willetts etc. for their marketisation policies of what used to be a public and common good – and a cornerstone of civilised and advanced society, and has been turned into a profiteering business. Did @SGHMartineau advise @warwickuni to gag @ThomasDocherty1? The historical King’s College London is in trouble. Kings London re-brand: neither a college nor a university any more. Glad that's sorted out… So what is it? A business, maybe? What about "Burger King's London" @KingsCollegeLon ? Surely attractive in "today’s highly competitive global marketplace"
King’s have abandoned the rebranding: the cost of that farce estimated at £ 300,000. Exeter College, and the University of Oxford remain silent about ‘Teflon Trainor’ and Warwick (including Docherty???) about Jan Palmowski “the man who put the ‘con’ in consultation, as they call him on the Strand. Thanks to John Allen for bringing my attention to the Valedictory Lecture of MM McCabe.